If you've been looking for a Horse Stable Blanket you came to the right place. This specific Stable Blanket happens to be one of our best sellers due the it's impeccable craftsmanship and affordable pricing. These Horse Stable Blankets come with quilted water resistant material which provides a great blanket for all climates, as well as a great turnout blanket for mild climates. These Stable Blankets are also composed of a 600 denier nylon shell, an internal 368g of fiber fill and a comfortable inner nylon satin lining. 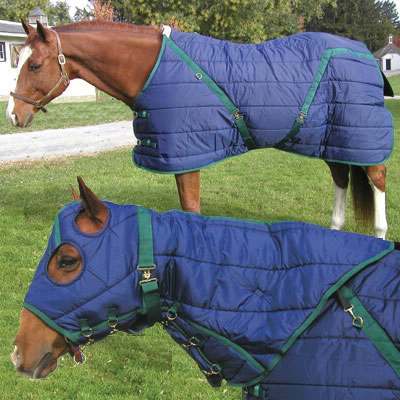 The High Spirit Snuggie Stable Blanket is accompanied by two adjustable straps at chest, as well as cross over surcingles and removable elastic leg straps. One Stop Equine Shop, Your number one source for Horse Stable Blankets and more.